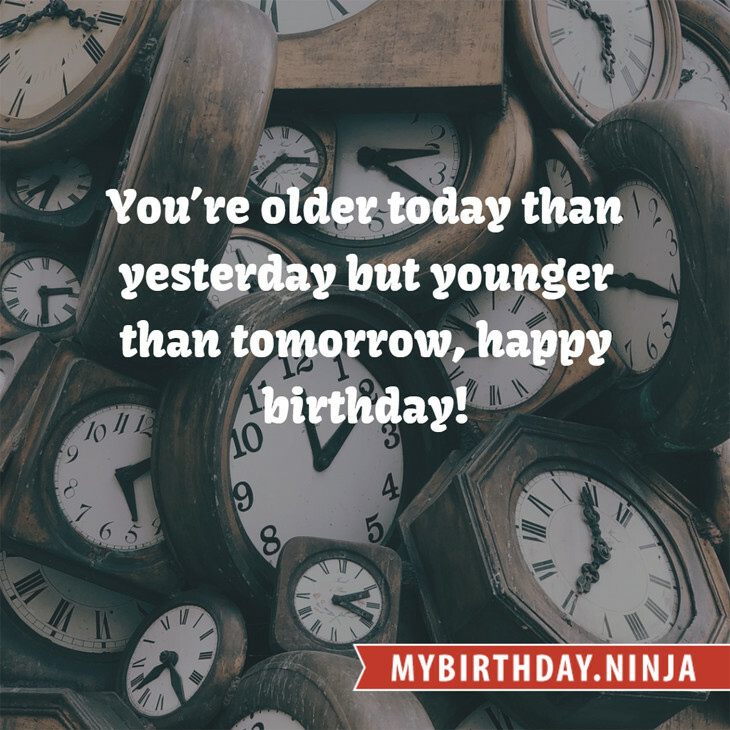 Here are some snazzy birthday facts about 26th of August 1983 that no one tells you about. Don’t wait a minute longer and jump in using the content links below. Average read time of 10 minutes. Enjoy! What day was my birthday Aug 26, 1983? August 26, 1983 was a Friday and it was the 238th day of the year 1983. It was the 34th Friday of that year. The next time you can reuse your old 1983 calendar will be in 2022. Both calendars will be exactly the same! This is assuming you are not interested in the dates for Easter and other irregular holidays that are based on a lunisolar calendar. There are 128 days left before your next birthday. You will be 36 years old when that day comes. There have been 13,021 days from the day you were born up to today. If you’ve been sleeping 8 hours daily since birth, then you have slept a total of 4,340 days or 11.88 years. You spent 33% of your life sleeping. Since night and day always follow each other, there were precisely 441 full moons after you were born up to this day. How many of them did you see? The next full moon that you can see will be on May 18 at 21:13:00 GMT – Saturday. Fun stat: Your first one billion seconds (1,000,000,000) happened sometime on May 4, 2015. If a dog named Bianco - a Rhodesian Ridgeback breed, was born on the same date as you then it will be 203 dog years old today. A dog’s first human year is equal to 15 dog years. Dogs age differently depending on breed and size. When you reach the age of 6 Bianco will be 45 dog years old. From that point forward a large-sized dog like Bianco will age 5-6 dog years for every human year. Hundred Years’ War: The military supremacy of the English longbow over the French combination of crossbow and armoured knights is established at the Battle of Crécy. World War I: During the retreat from Mons, the British II Corps commanded by General Sir Horace Smith-Dorrien fought a vigorous and successful defensive action at Le Cateau. Papal conclave: Albino Luciani is elected as Pope John Paul I.
Sigmund Jähn becomes first German cosmonaut, on board Soyuz 31. Earth Summit 2002 begins in Johannesburg, South Africa. What does my birthday August 26, 1983 mean? Your birthday numbers 8, 26, and 1983 reveal that your Life Path number is 1. It represents initiative, potential and singularity. You are a born leader. You insist on your right to make up your own mind; you demand freedom of thought and action. The following celebrities also have the same life path number: Nikola Šarčević, Chester Bennington, Mark Indelicato, Douglas Trumbull, Taylor Fry, Jerry Lewis, Nicola Bryant, Dev Patel, Chris Kattan, Aimilios Veakis. What is the birthday horoscope for Aug 26, 1983? The Western zodiac or sun sign of a person born on August 26 is Virgo ♍ (The Maiden) – a mutable sign with Earth as Western element. The ruling planet is Mercury – the planet of communication. According to the ancient art of Chinese astrology (or Eastern zodiac), Pig is the mythical animal and Water is the Eastern element of a person born on August 26, 1983. Fun fact: The birth flower for 26th August 1983 is Poppy for preparedness. 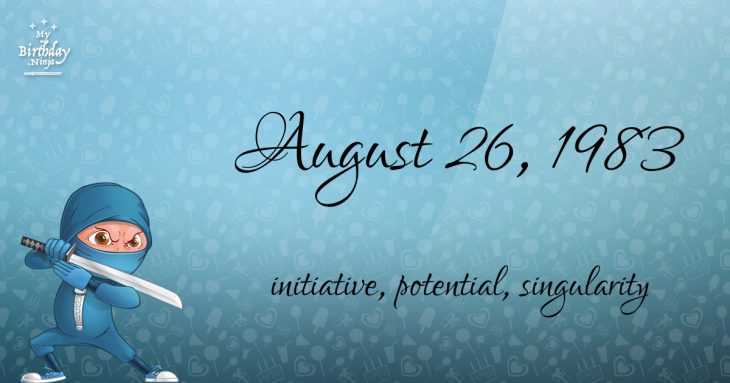 What is the Love Match for Aug 26, 1983? When it comes to love and relationship, you are most compatible with a person born on November 5, 1955. You have a Love Match compatibility score of +128. Imagine being in love with your soul mate. On the negative side, you are most incompatible with a person born on February 21, 1965. Your incompatibility score is -136. You’ll be like a cat and a dog on a love-hate relationship. Arf-arf, I want to bite you. Meow-meow, stay away from me! The number-one hit song in the U.S. at the day of your birth was Every Breath You Take by The Police as compiled by Billboard Hot 100 (August 27, 1983). Ask your parents if they know this popular song. I do not know how you feel about this, but you were a female ♀ in your last earthly incarnation. You were born somewhere around the territory of Yugoslavia approximately on 1500. Your profession was dramatist, director, musician, bard. How many babies were born on August 26, 1983? Base on the data published by the United Nations Population Division, an estimated 131,547,856 babies were born throughout the world in the year 1983. The estimated number of babies born on 26th August 1983 is 360,405. That’s equivalent to 250 babies every minute. Try to imagine if all of them are crying at the same time. What is the popular baby name on 26 Aug 1983? Here’s a quick list of all the fun birthday facts about August 26, 1983. Celebrities, famous birthdays, historical events, and past life were excluded. Try another birth date of someone you know or try the birthday of these celebrities: October 13, 1904 – Wilfred Pickles, English actor and radio host (d. 1978); May 2, 1927 – Ray Barrett, Australian actor and singer (d. 2009); May 1, 1968 – Sol Kyung-gu, South Korean actor.